Pickled Mustard Greens are commonly served with noodle dishes in some regions of Burma. Last time when I made Shan Noodles, a thought of having some mustard greens on the side seemed like a good option but I didn’t have them on hand. Since then, I’ve been thinking of making some but never really got to it. 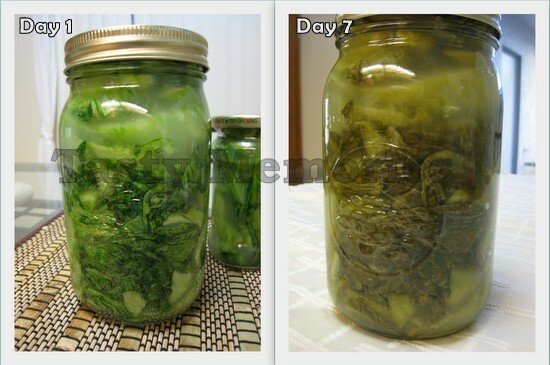 I remember that some time ago, my dear friend Lely made these pickled mustard greens and I got to taste some. It was very crunchy and tasty with a good sour punch. I really liked it so I asked her for the recipe. It is very simple and easy to prepare. There are different methods of preparing this from wilting the greens in sun to adding additional ingredients in the pickle. Since this is my first time preparing it, I just want to keep it simple so I followed her exact instructions. Pickling can take anywhere from 3 days to a week depending on the weather. Mine took a week as it was a pretty cold week. Place the greens in a large bowl, sprinkle salt and toss well. To make rice water, place rice in a pot or bowl and add about 2 to 3 cups of water or as needed. Scrub and rub the rice well with hands to get the water as cloudy as you can. Pour rice water over the greens and mix well. Place the greens in an airtight glass jar pressing down as much as you can to avoid gaps and air pockets. Fill the jar all the way up with rice water. Close it tight and leave it in warm place for 3 days to one week. It is ready when all of the vegetables are no longer bright green. You can taste to see if it has reached your desired sourness. The longer you keep it out the more sour it will get. Once ready, store it in refrigerator. Note: I used 1 quart Canning Jar and had some leftover so used one smaller jar for the leftovers greens.